Ocular drug delivery is related to the ophthalmic diseases which affect the eye or parts of eyes. According to the report by the World Health Organization (WHO), 1.3 bn people are suffering from vision impairment globally. Rising number of patients suffering from ophthalmic disorders and vision problems are boosting adoption of the ocular drug delivery and likely to fuel the growth of the global ocular drug delivery market. Additionally, growing aging population globally are more susceptible to suffer from vision impairment is creating the need for effective treatments and drugs are boosting adoption of ocular drug delivery and likely to bolster growth of the global ocular drug delivery market. Increasing investment in the research and development (R&D) activities in order to develop novel drugs are driving growth of the global ocular drug delivery technology market. Rising approvals from the US Food and Drugs Administration (FDA) are fuelling growth of the global market. Moreover, high number of pipeline drugs and other treatments are expected to offer lucrative opportunities in the global market for key players. Additionally, collaborative steps between vendors and hospitals are creating lucrative opportunities in the global ocular drug delivery technology market. According to the report by TMR, the global ocular drug delivery technology market is expected to expand with a CAGR of 6.8% over the forecast period from 2017 to 2025 to attain value of US$18.12 bn by the end of forecast period from US$10.2 bn in 2016. On the basis of technology, the global ocular drug delivery technology market is segmented into topical, ocular inserts, intraocular implants, iontophoresis, and in situ gel & punctal plugs. The ocular inserts segment is further classified in to non-erodible and erodible. Intraocular implants segment is further classified into biodegradable and non-biodegradable. Of these, topical segment dominated the global market in 2016, with more than 50% of the overall shares in the global market for ocular drug delivery technology. Thanks to these factors, the segment is expected to expand with 6.6% from 2017 to 2025. On the basis of formulation type, the global infusion pumps market is segmented into suspension, solution, liposomes & nanoparticles, emulsion, and ointments. Based on the disease type, the global infusion pumps market is segmented into glaucoma, macular degeneration, diabetic retinopathy, diabetic macular edema, and cataract. On the basis of region, the global ocular drug delivery technology market is segmented into North America, Asia Pacific, Europe, Latin America, and Middle East & Africa. Of these, North America is dominating the global market for ocular drug delivery technology and expected to continue its dominance over the forecast period tailed by Europe. Growth in the North America region is attributable to the demand for the targeted drug delivery systems. In 2016, the region accounted for massive 52.5% shares in the overall market. The European market accounted for 24% of the shares in the same year. However, Asia Pacific is expected to expand with higher CAGR over the forecast period thanks to the growing initiatives from the government for improving healthcare facilities. Some of the prominent players operating in the ocular drug delivery technology market include OCULAR THERAPEUTIX, INC., Allergan, Plc., Alimera Sciences, EyeGate Pharma, and Valeant Pharmaceuticals International, Inc. the market has highly consolidated vendor landscape. The top three companies such as Santen Pharmaceutical Co., Ltd., Alimera Sciences, and Valeant Pharmaceuticals International, Inc. accounted for 50% of the shares in the overall market. This report on the Global Ocular Drug Delivery Technology market analyzes the current and future scenario of the global market. Rise in private and public funding for R&D of novel drug delivery technologies, increase in prevalence of macular degeneration & diabetic retinopathy, and favorable regulatory scenario for introduction of innovative technologies are boosting the growth of the Global Ocular Drug Delivery Technology market. 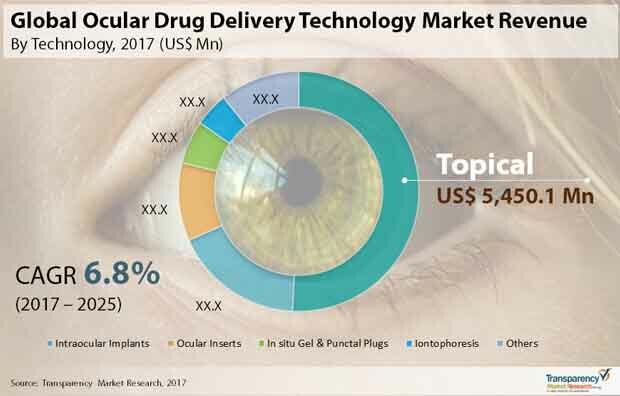 Rising demand for targeted drug delivery to the affected ocular tissue, and elimination of drug due to nasolacrimal drainage system when administered via topical route are some of the factors expected to drive the growth of Global Ocular Drug Delivery Technology market during the forecast period. The Ocular Drug Delivery Technology report comprises an elaborate executive summary, which includes market snapshot that provides information about various segments. It also provides information and data analysis of the global market with respect to the segments based on technology type, formulation type, disease type, end user, and geography. A detailed qualitative analysis of drivers and restraints, and opportunities has been provided in the market overview section. Additionally, the section comprises Porter’s Five Forces Analysis to help understand the competitive landscape in the market. This section also provides market attractiveness analysis in terms of geography and market share analysis by key players, thus presenting a thorough analysis of the overall competitive scenario in the Global Ocular Drug Delivery Technology market. Based on the technology, the Ocular Drug Delivery Technology market has been segmented into 6 types, which are Topical, Ocular Inserts, Intraocular Implants, Iontophoresis, In Situ gel & Punctal Plugs, and Others. Ocular Inserts are further divided into Erodible & Non-erodible types, while Intraocular Implants are classified into Biodegradable & Non-biodegradable types. Intraocular Implants & Topical are considered to be leading segments of Ocular Drug Delivery Technology market, owing to the high patient compliance. They are expected to continue to dominate the market in terms of revenue by 2025, which is attributed to the introduction of novel drug delivery techniques by key players in the market. The market size and forecast for each of these segments have been provided for the period from 2015 to 2025, along with their respective CAGRs for the forecast period from 2017 to 2025, considering 2016 as the base year. Different types of formulation types in the ocular drug delivery technology market are Solution, Suspension, Ointment, Emulsion, and Liposomes & Nanoparticles. Solutions accounted for highest market revenue in 2016, and is expected to remain leading in terms of revenue during the forecast period. The dominance is attributed to the introduction of preservative free formulation types & contamination free containers. Based on disease type, the global ocular drug delivery technology market is segmented into 7 major segments, which are Glaucoma, Macular Degeneration, Diabetic Retinopathy, Diabetic Macular Edema, Cataract, Dry Eye Syndrome, and Others. Macular Degeneration is anticipated to lead the market during the forecast period, owing to its high prevalence and government participation in spreading awareness for visual loss & blindness. Different types of end users are present in the Ocular Drug Delivery Technology are Hospitals, Ambulatory Surgical Centers, Ophthalmic Clinics, and Homecare Settings. Under the end user segment, Hospitals accounted for the largest share of the Global Ocular Drug Delivery Technology market in 2016, while Ophthalmic Clinics & Ambulatory Surgical Centers are expected to witness highest CAGR during 2017-2025. Geographically, the global Ocular Drug Delivery Technology has been categorized into five major regions and the key countries in the respective region: North America (U.S. and Canada), Europe (U.K., Germany, France, Spain, Italy, Russia and Rest of Europe), Asia Pacific (India, Japan, China, Australia & New Zealand, and Rest of Asia Pacific), Latin America (Brazil, Mexico, and Rest of Latin America) and Middle East & Africa (South Africa, GCC Countries, and Rest of Middle East & Africa). The report also profiles major players in the Global Ocular Drug Delivery Technology based on various attributes such as company overview, financial overview, product portfolio, business strategies, SWOT analysis, and recent developments. Major players profiled in this report include OCULAR THERAPEUTIX, INC., Alimera Sciences, Allergan, Plc., Valeant Pharmaceuticals International, Inc. (Bausch & Lomb Incorporated), EyeGate Pharma, Envisia Therapeutics, Clearside Biomedical, INC., Graybug Vision Inc., Santen Pharmaceutical Co., Ltd, Taiwan Liposome Company, Ltd, and others.